In my Down Country column in last weekend’s Sunday magazine in the Sunday Star Times, I wrote about making a batch of Jersey black butter, or nièr beurre. This spicy, treacle-coloured preserve dates back to the 1500s, when it was invented as a byproduct of the Channel Islands cider industry. The traditional method is to simmer it for 30 hours, stirring constantly, in huge copper cauldrons over an open fire. You know it’s done when a wooden spoon, pressed into a sticky dollop on a plate, adheres sufficiently to lift the plate. I don’t own a copper cauldron, and I doubt the council issues fire permits for preserving, so I made a scaled-down version in my slow cooker. Simmer 4kg peeled, sliced, cooking apples in 500ml fresh apple juice or dry, homemade cider for a few hours, till the apples turn to mush. Then add ½ cup caster sugar, a 40g log of natural liquorice, the zest and juice of 1 lemon, 1 teaspoon ground cinnamon and 1 teaspoon mixed spice. Ignore for the rest of the day, apart from the occasional stir. It took 12 hours for my nièr beurre to turn into thick brown sludge (anyone care to translate that into Jersey’s Norman-French dialect?). But trust me, it tastes far nicer than it looks. I’ve been spooning it over porridge, slathering it on hot cross buns and folding it into custard fools. It’s delicious stirred through thick Greek yoghurt, or, even better, local Clevedon Valley Buffalo yoghurt, the 2010 supreme winner in Cuisine magazine’s Artisan Awards. My father is from Jersey, when he returns his suitcase always contains a couple of pots of Black Butter. I’ll see if he can translate. -Are the 4kg of apples already prepared or is that weight before peeling etc? -The liquorice log, is it just normal eating liquorice and if not where do you get it? That’s the weight before peeling etc, although I have a nifty gadget that peels, cores and slices the apples with next to no waste. As for the licorice log – I used the RJs natural liquorice you can get at the supermarket. It comes in 40g logs. Otherwise use the Black Knight stuff – it probably has more flavour (it’s certainly darker). Have fun! V’là tchi prînt douze heuthes pouor qu’man nièr beurre s’nièrchîsse et s’affêtchîsse. We were lucky enough to be in Jersey last October and took part in the National Trust’s annual black butter making event, by helping with the apple peeling – they were willing to part with the recipe but it starts off with 13cwt of apples and 113 gallons of cider! That was a bit daunting to portion down to try making it, so I am very happy to have found your recipe, thanks to Auntie Google and the NZ Apples wording that was visible on your photo! I look forward to giving it a try this season as it is delicious stuff. You don’t have half a tonne of apples handy? (Heh). 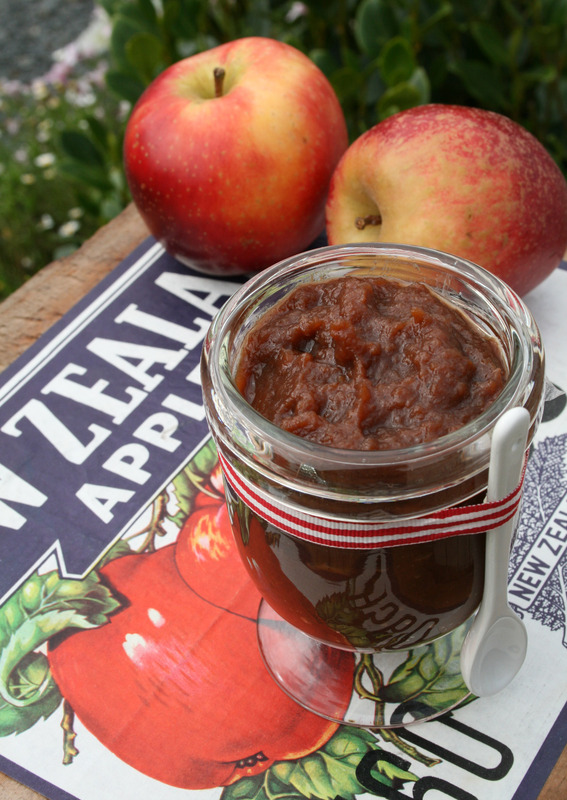 Good luck with your homemade apple butter – I’d love to hear how it turns out.